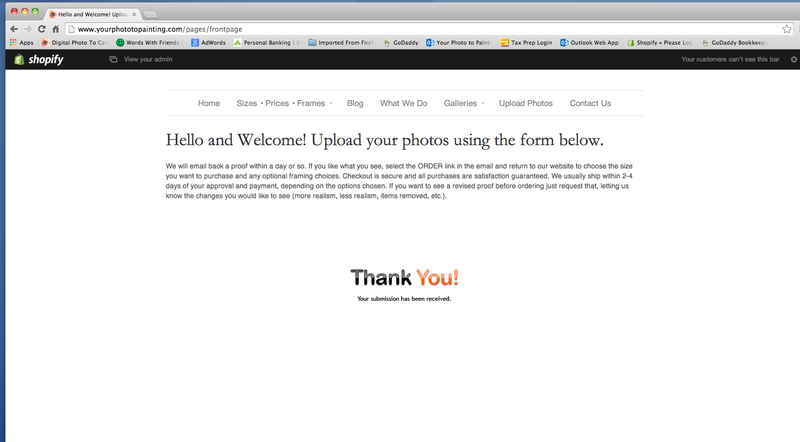 I use a Photo Upload form from JotForm that shows a simple "Thank You" after a customer selects the 'submit' button. As I understand it, he URL stays the same because it is an iFrame function. I need to be able to embed code from Google Adwords that will tell me when a conversion takes place (an actual upload). On my previous website an auto-responder was triggered that sent the 'thank-you' email and that particular URL was where I placed the code. As it is now the code will only tell me when a customer visits the upload page rather than actually uploads. Can I get help with this? Can the URL change when the upload submission is made? If my understanding of your requirement is correct, this is what you should do. This will change/redirect the URL(of your choosing) after form submit. 2. To be able to embed the Google ad words within your form, you can use the form's full source code embed.